Hear, hear! Meritocracy for all! This seems like a positive development. 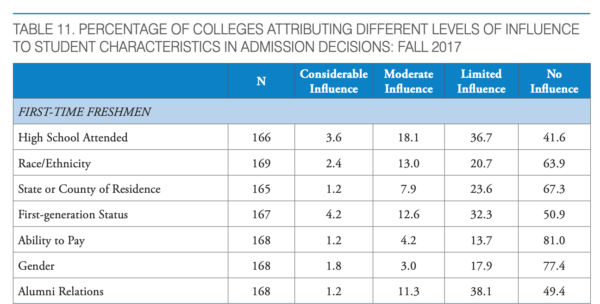 With affirmative action, individuals in these classes suffer the stigma of privileged entry into the academic system, which is a burden on top of others they already carry. They usually later get the chance to prove themselves as individuals, but AA makes it that much harder to do so. If I were (say) black, I’d want to be treated exactly as if I were white, neither better nor worse. That’s all anyone could ask for. Perhaps you would. Personally I use whatever I’ve got, whenever and however I think it will work. These are two great paths in life, in my opinion. I would sincerely not even hazard a guess as to which might be better. Nonetheless, I have a soft spot in my heart for those willing to die on a hill they believe in. Before proceeding at supersonic speeds to “how” and “why”, best to slow to snail pace to consider “if”, which strikes many of us as dubious. Yes, it might just be a remarkable coincidence that the creation of a Black middle class or the entrance of women into the professions happened right after the introduction of affirmative action. Or maybe ideological rigidity makes it impossible to see the connection. Does the right wing have an alternative way to address the persistent effects of historical injustice? Denying it or ignoring it doesn’t count. Also, no, I do not buy the supposition of causation here. Post hoc ergo propter hoc is a very weak argument. In my mind, it’s entirely plausible that AA slowed the progress of blacks and women, and/or has had long-run negative effects for them. The world is a very complex place, and simple explanations are often incorrect. Agreed, the world is very complex and almost anything is plausible. So please help us out by providing an empirical or theoretical argument supporting your point about AA, or links and synopses of arguments by others. We can envision several ways that AA might produce harm. For example, the existence of AA means that (for example) one’s first impression of an AA-eligible person is that they might not be as qualified as someone not eligible for AA. This is a harm for eligible individuals who are indeed as qualified, even though first impressions fall away with further experience. Also, there’s something demoralizing, or even humiliating, about having something handed to you, as opposed to earning it on your own. Are these decisive concerns? Hard to say. But certainly the possibility seems open that AA has been a net harm. And as to AA causing “creation of a Black middle class” above, is that even the right metric? Per Sowell, between the 1930s and 1990s, black children born to unwed mothers went from 31% to 77%. Considered that way, maybe things are worse. If the supposed negative effects consist of backlash by bigots who think they’re losing out because of AA, that doesn’t count either. The other claim I’ve heard is the so-called “mismatch hypothesis,” the ugly fiction that AA applicants are unqualified when in fact the problem is that the institution is failing to meet the different needs of URMs. This is also true for low SES white applicants, but somehow the “mismatch hypothesis” doesn’t get applied to them. I’m not sure those harmed by backlash would be happy to hear that their suffering “doesn’t count”. You don’t make policy based on how people should act. You make policy based on how people will act. You don’t make good policy by pandering to bigots. I just looked at that bottom screenshot. 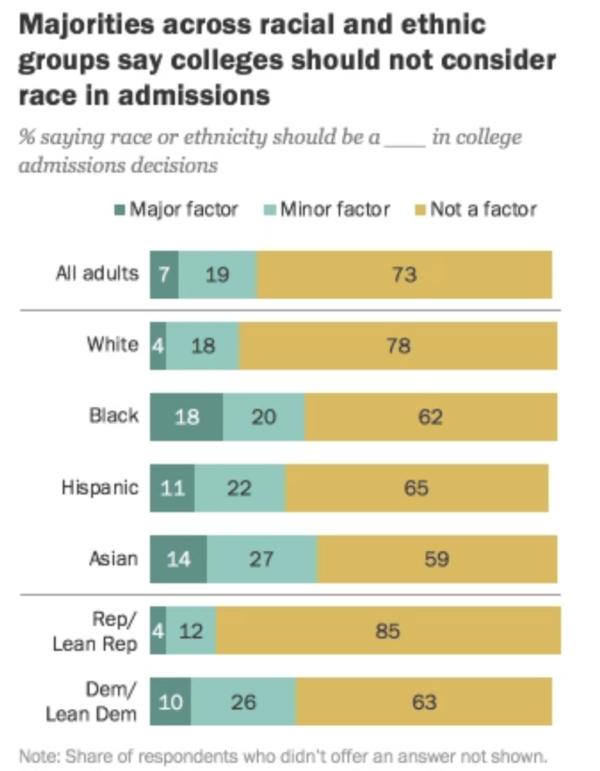 So only a third of schools use race/ethnicity as a factor, but more than half use “alumni relations.” So why is nearly all of the complaining about “meritocracy” directed at AA?